Two wild cases, but unfortunately characteristic for Turkmenistan, occurred in a short period in different parts of the republic. Women, one of whom is 76 years old, and the other is slightly less than 68 years old, were viciously attacked. On the night of 28 to 29 October in Dashoguz, somebody threw stones in the windows of Khalida Izbastinova's flat shattering them. 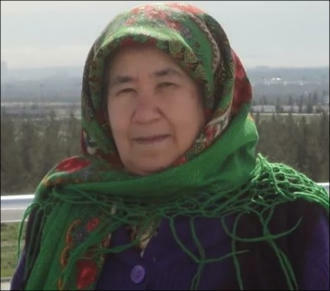 Two weeks later, on 14 November, in Ashgabat, Soltan Achilova was attacked in broad daylight. The "fault" of the first woman is that she is the mother of a Turkmen opposition and human rights activist, and the second is the correspondent of the "Azatlyk" Radio ("Freedom") banned in Turkmenistan. Who could act so impudently and certainly with impunity? In the case of Khalida, it is still unknown, although the woman complained to the police. But the attacker of Soltan Achilova initially did not even try to hide. As the journalist reported, "it was a dark man, looking 25-30 years old, wearing a black jacket and blue trousers." The rest of his accomplices sat in the car, which on the day of the attack followed the woman closely around the city, whether she walked or went by public transport. Moreover, on 27 November, Achilova was again attacked - the second time within two weeks. Three civilians, at the time when the journalist was recording the demolition of buildings in the metropolitan area of Keshi, twisted her hands and forced her into a police car. The law enforcers took Achilova away in an unknown direction, however, later after receiving some instructions on the phone, they returned her to the same place of her apprehension. They returned her camera after destroying all the footage. We can be indignant and outraged at what is happening in Turkmenistan, but it would change a little: besides the state terror, the everyday persecution of dissidents and "unreliable" people, as it was ten years ago, still flourishes. The so-called "law enforcers in the field" are engaged in this, and they are tasked by the "grey cardinals" in the special units in the structure of the Ministry of National Security (MNB). These special forces have been establishing a total control over the society, leading campaigns to identify those who are "unreliable" or those who simply express discontent or voice it aloud, thus attempting to gain more rights. With the development of the Internet and the growing popularity of social networks, special services have significantly more to work with, even in such a closed country like Turkmenistan. Tracking proactive commentators, revealing visitors of group communities "spreading distempers" in social networks, catching the hands of those who take photos in public places and then sending photos outside the country (only images of the walking or equestrian president, new Avaza buildings, palaces in the centre of the capital, applauding crowds in national costumes should reach abroad) - this is what the bloated staff of the Turkmen MNB are today occupied with. And no matter who is in front of them: a young man, an elderly woman, a disabled person - a war against everyone will be unleashed until the victorious end. 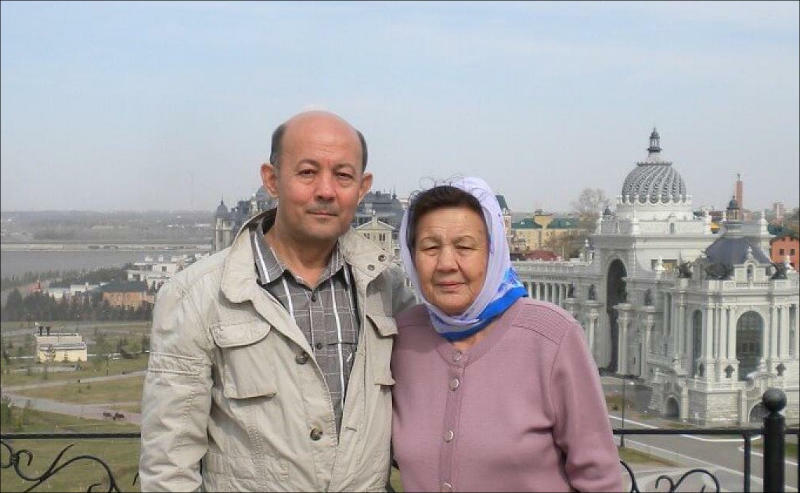 Khalida Izbastinova with her son, Farid Tukhbatulin, the editor-in-chief of the "Chronicle of Turkmenistan"
Turkmen leaders, in their attempts to look as democrats in the eyes of the world community, cannot afford to shoot dissidents with artillery, as it is customary in North Korea. Everyone can hardly find messages from Turkmenistan saying that someone has been punished for dissent at the state level - on the contrary, they report on another amnesty every year in Ashgabat timed to the Day of the National Flag, Independence Day or some other holiday. First, there are very few persons left to imprison, indeed - everyone who represents even a slight threat to the regime, had long been behind bars. Secondly, Gurbanguly Berdimuhamedov and his cronies wish not to spoil their karma, so they act cowardly, with caution, using mundane and even viler methods of pressure. Moreover, in this case, the authorities often resort to the services of persons who have been convicted for various criminal offences. In 26 years of independence, there have been many cases when criminals got involved in the struggle against activists and independent journalists. And not only they. The MNB can divert suspicion from themselves applying a variety of the most antisocial types that they have at their disposal. For example, the incident with journalist Annamamed Myatiev that happened at the end of 2011, when he, like Khalida Izbastinova, has his flat windows smashed. The police were quick "to find out" the attacker; it turned out to be someone named Ruslan Shireev, unemployed and with no identification documents. His family emigrated from Turkmenistan when he was serving in the army. Somehow the young man, after the military service, was left without documents, which made him impossible to reunite with his family. The bureaucrats, under various pretexts, did not give him a new passport making him a stateless person. At some point, Shireev was forced to work for the MNB and carry out their assignments. He was not punished for his actions against journalist Myatiev. Most likely, the same will happen with the complaint of Khalida Izbastinova to the police. A year ago, unknown people snatched the phone from the hands of Soltan Achilova, while she was photographing the queue for cigarettes at the Lachin store in Ashgabat. She, like other harassed activists, is convinced that the MNB and police officers in rare cases disguise themselves as criminal elements in plain clothes. Sometimes special services and police play whole performances. Widely known is the story that happened with the Dashoguz ecologist Andrei Zatoka. On his birthday in October 2009, Andrei left to the city market to buy food for a festive occasion. At this moment a provoker named Adylbek Kazakov, previously convicted for drugs, attacked the man. After provoking a fight with Zatoka, he then stated that the ecologist allegedly stepped on his foot, and then completely twisted and beat him. Already nine days after the incident, the court promptly trialled Zatoka as a hooligan and imprisoned him for five years. But the main goal of the Turkmen authorities was to completely get rid of the activist and oust him out of the country, which in the end has been successfully accomplished. Victims of similar provocations were Dunyagozel Dzhumaguliyeva, the resident of the Sayat district of the Lebap velayat, who was interviewed by the foreign radio station, and Hekim Hajiyev, the civil activist from Balkanabad, who earlier addressed the president with the open letter about regular thefts in the production. In their attempts to spoil the lives of dissidents, the security services are not disdainful even with such trifles as leaving the bloodstained sheep head under the door of Natalia Shabunts, the civil activist. The list of methods of domestic terror in Turkmenistan is very extensive: from exhortations like "it is unpatriotic to wash dirty linen in public and complain about life" and threats to be disgraced in the eyes of neighbours and colleagues to direct physical influence. When all these methods fail, criminal proceedings are fabricated against a proactive person, and he is imprisoned. The spreading of fear in society as a whole and each family separately is also an everyday terror, and with sophisticated methods. The authorities have thoroughly studied the nature of Turkmen family ties and values, and this knowledge is used to the full. It is too easy to bring trouble to a cohesive, it would seem, family: pain spots and weaknesses have been studied. Work begins with relatives of the "unreliable" person, and now a brother turns away and negates communication, a nephew does not call for his wedding, a sister's home ceases to be hospitable. The severance of family ties is very painful for the Turkmen, so many are silenced and reconciled, which is understandable: not everyone will consciously go to cause problems for someone close to them and turn out to be an outcast. Threats like "you have children / grandchildren, live for them," "sister / brother will lose their jobs," are very sobering. But there are methods of exerting pressure on people who are not burdened by numerous relatives. For example, the dissemination of a knowingly false and discrediting information about a person, mutual intrigue, the creation of an information vacuum around the person depriving him of all kinds of communication with the outside world. This includes both wiretapping and shadowing. Soon the neighbours begin to understand, whose soul is wanted by an unfamiliar car coming every day at their house and standing for hours, It has tinted windows, behind which the camera lens flashes from time to time. The neighbours begin to look at the tenant with suspicion, shun him, avoid talking to him. Here, too, information rushes as quickly as possible that the neighbour is a "renegade," "enemy," "critic," "a slanderer of the president's policy." And although most of the residents know their neighbour very well, who will argue with the special services? Better to save one's bacon. One can only wonder that even in such an atmosphere of fear, moral pressure, universal suspicion and mistrust, there are still people in the country for whom the notion of civic duty is not an empty phrase, but what they associate their lives with most naturally. And if so, then society is not hopeless, even if it has been plunged into the "The Age of Power and Happiness" announced by the President of Turkmenistan, which can rightly be called "The Age of Power's Insignificance".